Estimated insurance prices for a Ford Edge are $1,284 every 12 months for full coverage. Comprehensive insurance costs on average $254, collision costs $482, and liability is estimated at $390. Liability-only coverage costs approximately $452 a year, with high-risk coverage costing $2,780 or more. Teens pay the most at $4,856 a year or more. Rates include $500 policy deductibles, 30/60 liability limits, and includes additional medical/uninsured motorist coverage. Rates include averaging for all states and for all Edge models. For a middle-aged driver, insurance rates for a Ford Edge go from the cheapest price of $452 for just the minimum liability insurance to the much higher price of $2,780 for a high risk driver. Living in a larger city can have significant affects on car insurance rates. Rural areas are statistically proven to have more infrequent accident claims than cities with more traffic congestion. The example below illustrates the effect of location on car insurance rates. These rate differences show why everyone should get quotes based on a specific location and their own driving history, instead of using averaged prices. 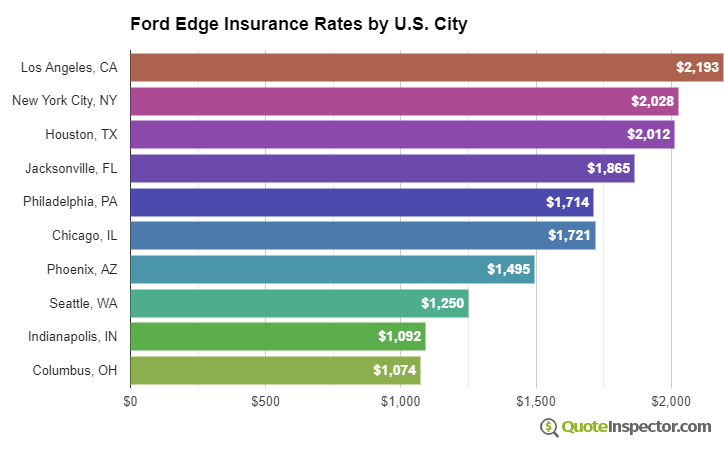 The chart below shows estimated Ford Edge insurance rates for different risk profiles and scenarios. Insurance prices for a Ford Edge also have a wide range based on physical damage deductibles and liability limits, your driver profile, and the trim level of your Edge. Where you choose to live plays a big part in determining prices for Ford Edge insurance prices. A good driver about age 40 could pay as low as $850 a year in states like Idaho, Maine, and Iowa, or have to pay at least $1,830 on average in Michigan, Louisiana, and New York. With such a large range in prices, the only way to know exactly what you will pay is to regularly compare prices and see which company has the best price. Each auto insurer calculates prices differently, so the prices will be substantially different. Rates are averaged for all Ford Edge models and trim levels. Rates assume a 40-year-old male driver, full coverage with $500 deductibles, and a clean driving record. Finding better rates on car insurance takes being a good driver, having good credit, not filing small claims, and bundling your home and auto policies. Take the time to shop around at least every two years by requesting rates from direct carriers, and also from local independent and exclusive agents. The following list is a summary of the information that was covered in this article.